Red-headed Woodpeckers excavate cavities in large, dead trees called snags. Yet, over much of the Red-head's range, snags are frequently cut down as unsightly, or because they make good firewood. There are ways we can help the Red-headed Woodpecker -- and many other woodpeckers, too. The key is to leave snags intact. If you must cut down a tree on your property, consider leaving the lower trunk as a snag - a veritable condominium for wildlife! When are the sounds of construction also the sounds of conservation? 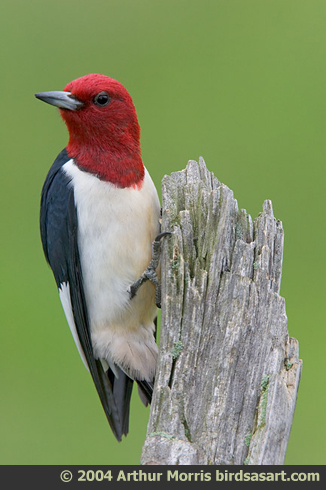 One example is when they come from the building of nestboxes for birds such as the Red-headed Woodpecker. But why build a nest box for woodpeckers? Don’t they carve out their own homes? They do. Red-headed Woodpeckers excavate cavities in large, dead trees – called snags. [Red-headed Woodpecker calls] Yet, over much of the bird’s range, snags are frequently cut down as unsightly, or because they make good firewood. The Red-headed Woodpecker is a striking bird. Its scarlet head glows in sharp contrast with its flashy black-and-white wings. It’s a head-turner, even for those who rarely notice birds. Native to the East and Midwest, its numbers have dropped by more than half since the 1960s, largely through loss of suitable nesting habitat. There are ways we can help the Red-headed Woodpecker. The key is to leave snags intact. The woodpeckers will prosper even in city parks and on golf courses – as long as managers protect snags. Meanwhile let’s keep building those nestboxes. You can find plans on our website, birdnote.org. Sounds of the Red-headed Woodpecker provided by The Macaulay Library of Natural Sounds at the Cornell Lab of Ornithology, Ithaca, New York. Drilling 105281 and call105460 recorded by G.A. Keller.